“Psycho” ages extremely well over the course of fifty years. Today some of the plot points have been reduced to cliché in parody after parody, but the movie is so well made that the artistry keeps it fresher in each viewing even after you know all the secrets, knots and twists. Marion Crane (Janet Leigh) and Sam Loomis (John Gavin) are in love. Sam is divorced and in no condition to marry Marion because most of his money goes into alimony. Marion is sick of being stuck, and when given the chance, steals $40,000 from his employer. She runs away and stops by the Bates Motel, meets the owner Norman Bates (Anthony Perkins), who lives with his ill mother. Norman is likable and handsome at the first sight, but we quickly sense something is not quite right about him. He and Marion connect in the way that they are both trapped, and hiding a secret. Then it comes to the most famous twist at exactly 47 minutes into the movie. Hitchcock shot it in one week, with 77 camera angles, 50 cuts, and the sequence lasts only 3 minutes (I didn’t count, the figures vary from source to source). It has to be the most studied murder sequence of all time. Notice the scene when the water goes down the drain, then dissolves into an extreme closeup shot of the lifeless eye and slowly zooms out as the life is draining away from the pupil. Does it look like I am giving a lot of plot away? If you do not know the secret yet, expect the unexpected. In fact, Hitchcock insisted that all viewers should arrive at the cinema on time, and requested that nobody should give away the secret. In a more extreme measure, after he bought the right of the original novel, he also bought every available copy of the book to avoid the secret being given away. This is also the last black and white film by Hitchcock, who shot this cheaply with US $800,000 and in black and white to get a cheap b-movie look. Against the studio’s wish, he even employed his television crew instead of his usual team that made his other sleek thrillers to achieve this purpose. It is as much a disguise as everything from the plot, down to the characters. He toys with us, misleads us, in order to surprise us. In a way, we are as much the victims of Hitchcock as the victims of the murder in “Psycho”. And check out the beautifully designed opening sequence of the movie on Vimeo. “Psycho” (1960) is directed by Alfred Hitchcock, starring Janet Leigh and Anthony Perkins. This is a truly horrifying and strangest movie experience set in a claustrophobic Hollywood mansion in the tradition of the german expressionism. Once a famous child star, Baby Jane Hudson (Bette Davis) never goes beyond a second rate actress, overshadowed by her sister Blanche Hudson (Joan Crawford) who has become a bigger star that she aspires. Blanche is crippled in a mysterious car crash allegedly orchestrated by Jane. Reclusive and bound to a small room, Blanche depends on the increasingly insane Jane on her breakfast, lunch and din-din. It’s hard to mention this film without citing the real life quarrels between Bette and Joan which fuel the on screen hatred between the two characters, but it is Bette’s performance as Jane that makes this film instantly unforgettable. Jane applies pile of make-up on her aging and ugly face, dresses like she is still 10 years old, and buries herself in the world of fantasy and booze. As things pile up, she becomes more violent to her sister, shutting the paralyzed Blanche from the outside world, serving her meals of contents I wish not reveal here, dreaming of a come back as she practices her old act as the Baby Jane Hudson. David Lynch has not yet created something quite like the scene as Jane dances and sings in the aging mansion. 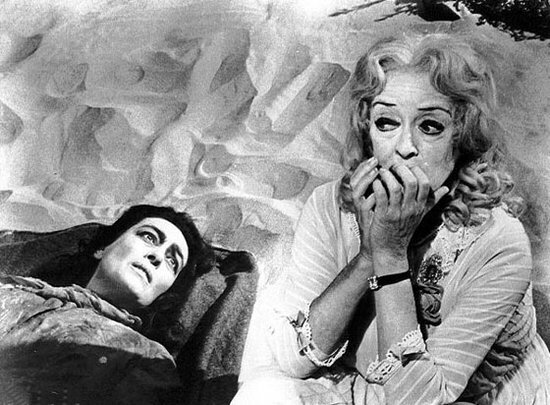 The film is escalated from a melodrama to a true psychological thriller and ultimately the tragedy of Baby Jane when the secret is revealed near the end. Blanche is seen here as the helpless good hearted sister that we identify with all along, but she is as guilty as Jane herself in the road of greed, regret and hatred. Ended with the only redemption of two cones of strawberry ice-cream.